There are large disparities for Africans and African Americans in diabetes, heart disease, and stroke when compared to white Americans, including higher rates of death and younger ages of death. Diabetes, heart disease, and stroke are three of the six leading causes of death in Minnesota, according to the Minnesota Office of Minority and Multicultural Health. Through the EHDI program activities, WellShare International is working to reduce the risk factors for diabetes, heart disease, and stroke. We expect to see a reduction in negative health outcomes such as diabetes diagnosis and unhealthy weight gain, as well as increased consumption of healthy food, increased daily physical activity, and an increased sense of well-being and trust in the services of CHWs. 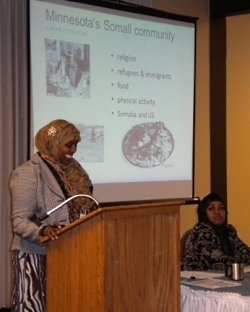 The purpose of WellShare’s EHDI grant is to create sustainable, culturally-appropriate approaches to and tools for preventive community health to support the Somali community in the Twin Cities. Three WellShare Community Health Workers (CHWs) work with the community to promote behavior changes that will reduce the risk of diabetes. The team tailored programs, messages, and interventions to be culturally appropriate and specific. 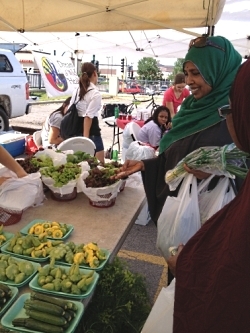 Activities include the creation of a culturally-specific pre-diabetes and weight management informational DVD in Somali to supplement the curriculum, culturally appropriate exercise classes for elders, and grocery store tours to promote healthy food choices. Our EHDI program also works with health care providers to build capacity for supporting patients along the path to wellness. By offering training to physicians and Community Health Workers, WellShare’s EHDI program is helping to build the infrastructure needed to improve care and reduce health disparities. WellShare International’s Somali Advisory Committee, CHW Peer Network, Hope Health Adult Day Center, Somali Senior Center, Skyline Towers, Franklin Terrace, Cedar Riverside Pavilion, Minneapolis Television Network, Pillsbury United Communities, Cedar Riverside Safety Center. To learn more about this program, please see our EHDI Report. Booklet | 4 pages | English Audience: Health care providers Description: This booklet was developed to address the frustration felt by many patients when their health care providers did not give specific enough advice, as well as the frustration felt by many health care providers when their clients did not show motivation to improve their health. 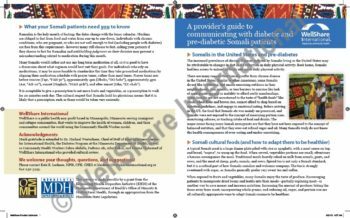 Using a Motivational Interviewing model, this booklet gives a brief primer in Somali culture and shares sample dialogues to improve doctor-patient communications.